My next project is to get my Nana's favorite flowers so I can do the same in the memory of my other grandparents! Such good people, and examples of time hardened marriages! Their grey hair are crowns of glory as spoken in proverbs, and had so much to pass on I just did not have time or the experience to fathom. The four hour trip, planned afternoon meetings, getting a work out....the plans of man. The morning storm in the nation's capital...three inches of snow...two cancelled flights (one after I was on board! ), the broken luggage carousel adding over an hour to bag recovery, cancelled meetings and arriving after thirteen hours in the dark on a cold blustery night revealed the plans of nature. I kept my calm...almost completely...read two good books by Scott Hahn and most importantly when I thought I was just going to be beyond frustrated for the day found the place to say my rosary. See I needed calm, and the big glass windows overlooking the tarmac and runways called me. There I stood in the long Atlanta winter sun, the warmth making me relax, and my rosary called. This morning, before the raindrops came falling down around us...I got to spend some time with two legendary cars (as well as two younger siblings). Yes I visited a Shelby Cobra collector and it was fantastic. 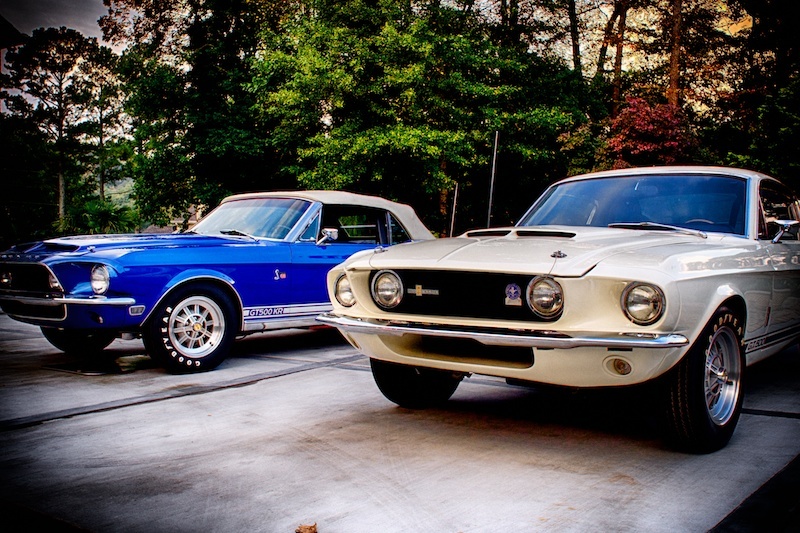 These are a '67 Shelby (number 500) and a '68 Shelby KR. They are wonderful automobiles. True museum pieces if I ever saw one...except these are working samples. Both got back inside before the rain started coming down to protect their original coats of paint. Hearing the engines was also a wonderful experience. I wish I could give you a sample of the sounds along with the photos. The owners were fabulous hosts! I'd just like to extend my thanks to the owner and his family for welcoming me into their home today. I am excited to return soon and complete the job on a drier fall day. I'd also like to thank them for letting me add these to my public portfolio! I'm very excited. My son and I had a great time at Caffeine and Octane on Sunday morning. I cannot reveal the details yet, but lets just say this photo is practice for an upcoming project. Although we had many challenges as a family this weekend, it turned out alright. Now I'm getting ready for another good work week with great people solving problems. I can only thank God for the opportunity to care for my family and others whenever possible. Jesus is the greatest example of selflessness in history...and I hope I am living the calling he set before me. P.S. Fujifilm X-E1 post in Nik Color Effex4..and a touch of sharpening in Aperture with a brush. As always if you want to know what I did, contact me and I'll share. Oh tonight I had to laugh at irony. See in our house we have two thoughts on social media. I use it to connect with people, but I do try to be pretty careful with where and what I publish. I know that it is probably not going to go away in my lifetime. So I just try my best to deal with it. My wife hates social media. It can all burn in hell for all she cares. She likes her cave, and the telephone. Give her a call or set up a visit is her motto. Well tonight a family friend reconnect via some social media. We've been out of touch, and our two families had a pretty busy couple of years. So by luck she finds me on one of those blasted social media sites, requests to be linked up, and we share numbers. Since this is my wife's good friend I send the number and tell her just minutes later. Now I sit here 70 minutes later and the two friends are still going strong on the phone. I am sure I will go to bed and be followed when I am fast asleep. To be honest I am happy she is on the phone. Just a few nights ago I was enjoying a conversation that took me back to my highland home in N.Y. twenty two years ago. So it is a good event we should be joyous for. I just hope she remembers it resulted from that blasted social media. So the motto for the night is social media is ok when used in moderation. The power of a friends voice is a timeless remedy for many of the trials we face in this journey. So do yourself a favor, put your life in reverse and connect with an old friend. Share your journeys, pray for them, and I am sure you will sleep with a smile on your face tonight. P.S. Pentax K-5 from 18 months ago. I reprocessed this one in Capture One Pro tonight. I really like what that program can go out of the box. I don't know about you, but this almost feels like we're going to have a year without a summer! The flowers and blooms though are trying to come out and enjoy the sun. Just a quick shot from the yard in the fading spring light this weekend. These flowers are very graceful for a day at most, then they get twisted, and lose a lot of their appeal. So if I want a shot of them, I need to photograph them as soon as they open. So the lesson of the day is to take the shot now, because you never know if it will be there tomorrow. Good lesson for life as well. Out at Old Car City not all is lost in terms of color! I wanted to combine the chrome and color for a few shots, and this was my favorite if the bunch. This is one of the few I set up that was not HDR. The image just came out better is way. Lesson for the day is that sometimes less is more! I think that was an important part for me to digest last night at the movie. God really does give us what we need for anything he expects of us. While we may always want more skills, riches, or luck....he equipped us with just what we need. So just work with it and trust in him! Ok I'll admit I'm working on the last part myself! That is my cross to bear. A quick post for today. I love photojournalism. In this genre I find that the key to a photo to to capture the story and emotion in one frame. It is a great challenge to have! Well this is my son at the closing concert of an orchestra one day intensive. He was intense as they played their patriotic songs and those of God's glorious nature! The shot was as captured in camera. One advantage of my Fujifilm camera is that the film simulation modes have some easy customization features. As a result putting a curve into the photo, and then using EV compensation eyeballed through the Electronic Viewfinder shortens my time in post on most family shots...and many jobs. While at Old Car City a two weeks ago I had some fun with hubcaps! Yes those fancy things on your wheels! As with all chrome and HDR I found the hardest two challenges to be removing the HDR blues and keeping myself out of the reflections. I have a lot to learn in both areas, as with everything else experience and review will help me get better in the future. Now many of you are proficient in Photoshop so removing this blue tint from chrome is not too hard if you know the six mask, layer, etc tricks available in that venerable program. I on the other hand do not "know" photoshop. I can still get the blue out pretty easily though using two other tools I have on hand OnOne Perfect Effects or Nik ColorEfex. To get rid of the tint Perfect Effects simply go to the color masks and select Purify Highlights, and then on a second layer select Purify Shadows. Move the sliders left and right to get the effect you want. Don't want it on the whole photo? Select brush in and apply like you would in Photoshop. I use these not as stand alone options, but as round trips to and from Aperture. You can do the same thing in Lightroom. Ok that is the tip of the day.